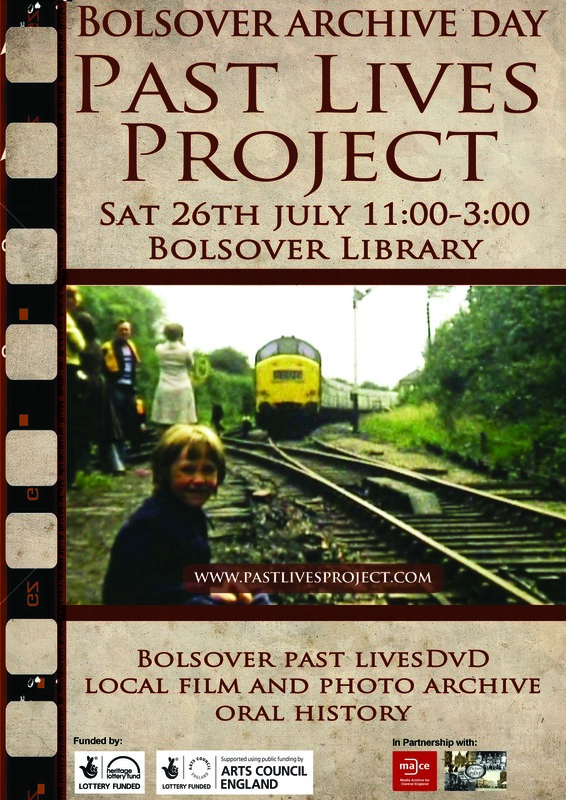 On Saturday 26th July we will be in the Library at Bolsover to share the Bolsover Past Lives archive of photos, digitised cinefilm and oral history, the DVD of the Bolsover Past Lives with soundtrack performed by students from Bolsover School with Past Lives Project musicians will also be on sale to the public, with a free copy for each film depositor. Drop in between 11:00 – 3pm and say hi! 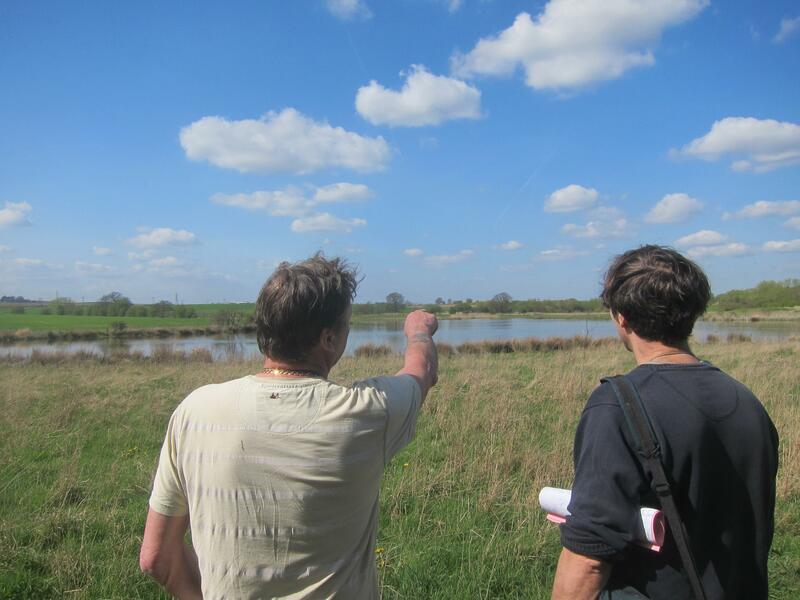 Chris Ellis, Past Lives Project musician and music researcher took a walk with Fred Webley , who grew up in Carr Vale and agreed to show us the landscape he remembers as a boy. 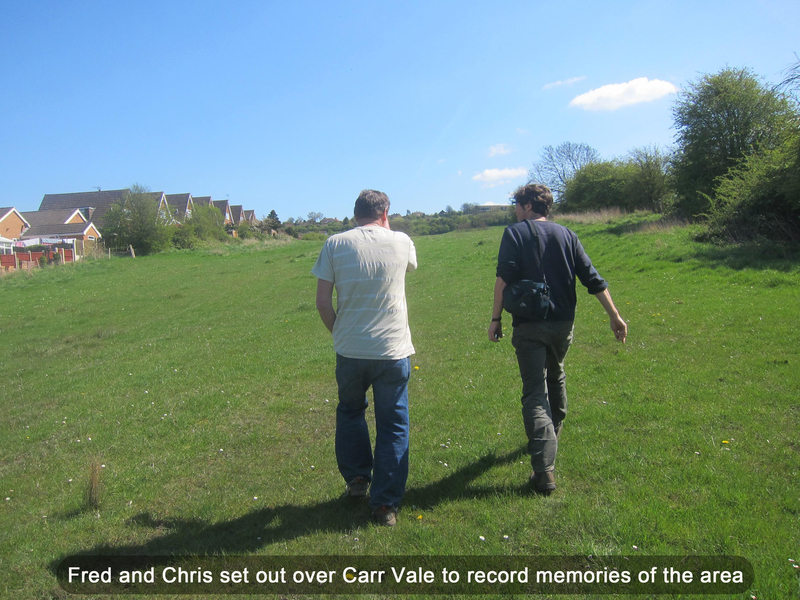 Chris has recorded this walk which we are hoping to make available as an audio walk through Past Lives Project. 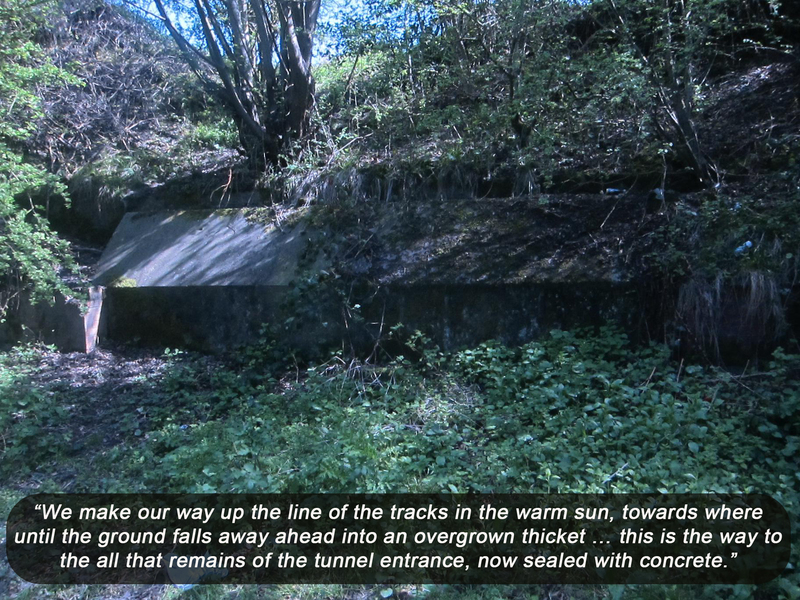 We make our way up the line of the tracks in the warm sun, towards where until the ground falls away ahead into an overgrown thicket … this is the way to the all that remains of the tunnel entrance, now sealed with concrete. On the way back down, we look again for remains of the water works but it has all been erased, though the brook still runs clear, right down past the ends of the lower streets of the town & into the valley, Fred remembers playing in the brook as a boy – damming up the water which, coming as it did from natural springs via a drinking water filtering system, was crystal clear. The series was apparently shown only once, in 1981* – and copies are rare: no-one I have spoken to has seen it… it would be good to see those sequences of Carr Vale…maybe we will have a look for it. We’re standing on the track bed of a branch of the Midland line that served the local collieries and the Byron Brickworks – where Fred got his first job at 17. 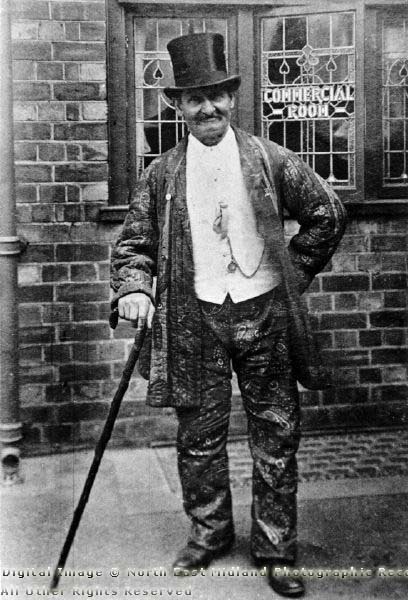 He was in the brick pressing room two weeks later when the news came that the plant was to close. 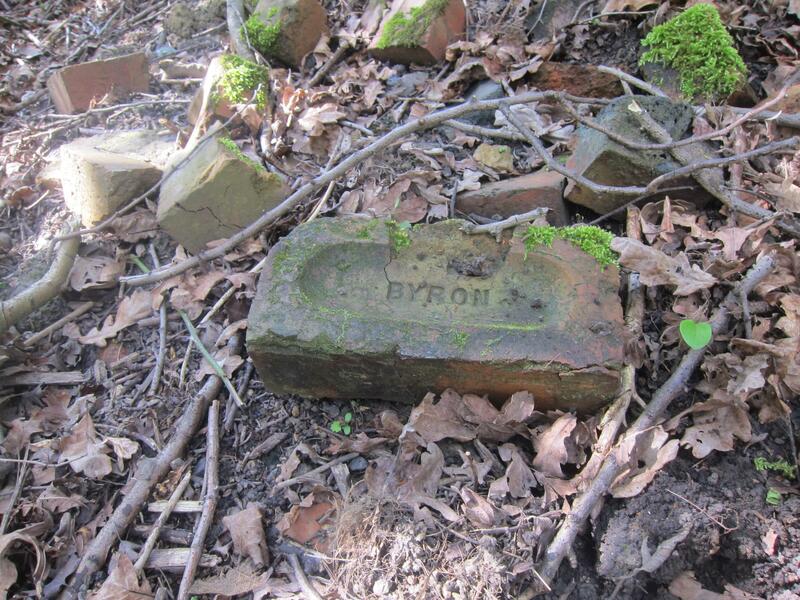 The site and its rail sidings are covered in birch and sycamore trees now, but Fred can locate the surviving loading bays in the undergrowth where the coal for the kilns arrived; and further into the trees we find traces of the high quality bricks that were prized for their durability; they are noticeably dense & heavy to lift; Fred reckons these were mostly rejects by the look of them. We’ve been walking south along the railway line from Carr Vale. Now we turn North and take a path that runs back up the valley alongside the River Doe Lea. subsidence: the coal seams under the river were dug out more cautiously than the area surrounding it, leaving more columns of coal & rock standing to support the ground. As a result, the land around the river sank unevenly and created these dips; later we see lines of fence posts disappearing into the water. As we walk we talk of the experiences of a childhood in this valley: the favourite haunts and games, the long six weeks of freedom in the summer. There were dangers to be sure – and Fred tells of boys who died in accidents while playing around the railway wagons or clambering into tunnels. But without taking these lightly, there was also a freedom to roam that it’s hard to imagine now. As we come closer to Carr Vale again, we scramble up the embankment that once carried Arkwright’s railway east across a viaduct and through the town. This is the site of one of Fred’s childhood exploits: pushing empty wagons up the incline as a gang & then riding them back down to hit the buffers at the bottom. 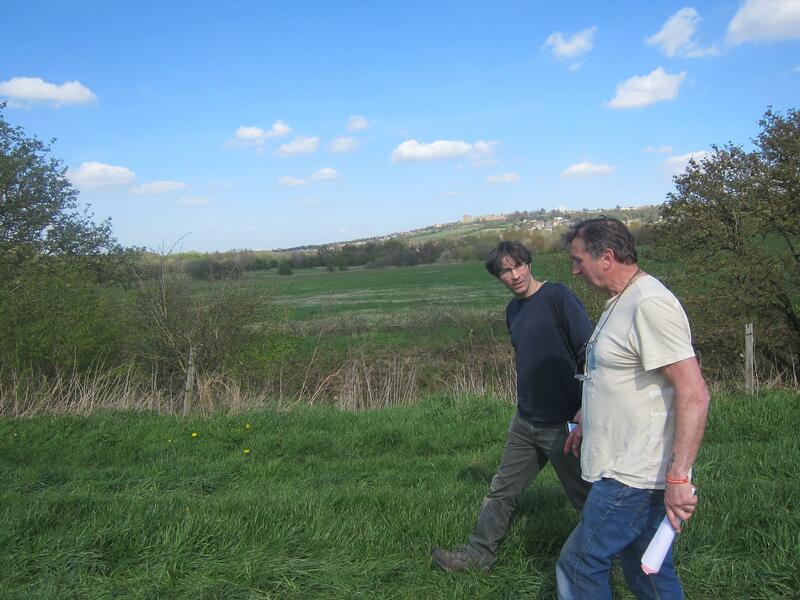 We are about 15miles as the crow flies from Lawrence’s home territory in Eastwood… a good days walk. 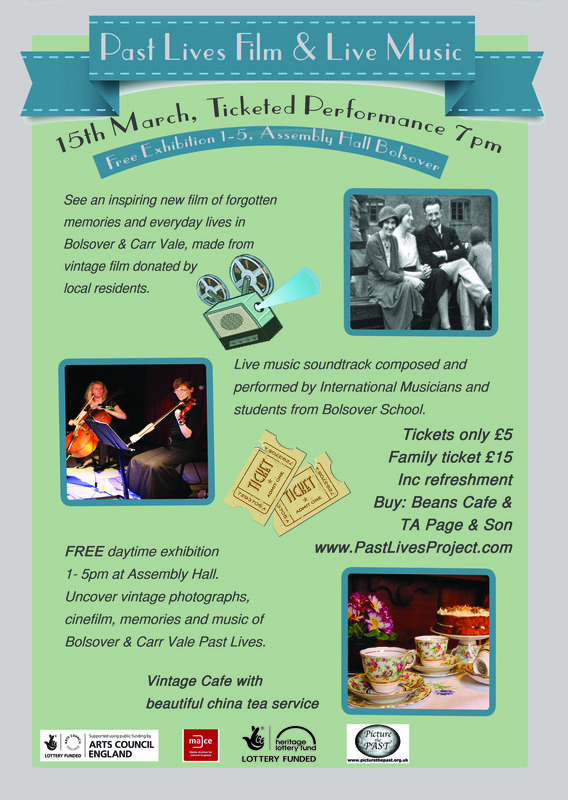 On 15th March we showed the Past Lives Bolsover film, with live music performance to a packed house at Bolosver Assembly Rooms. The film was made from local donated cinefilm edited by Anthony Hatton and the music was performed by Bolsover School Pupils who had worked with Dave Sturt and Chris Ellis. 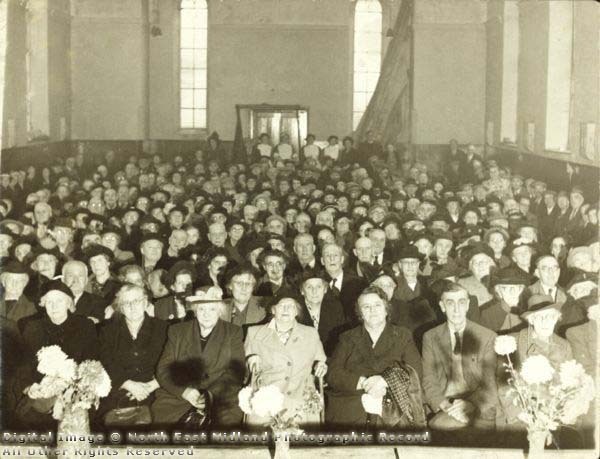 200 people came to the film and music performance, with people queueing out the door. 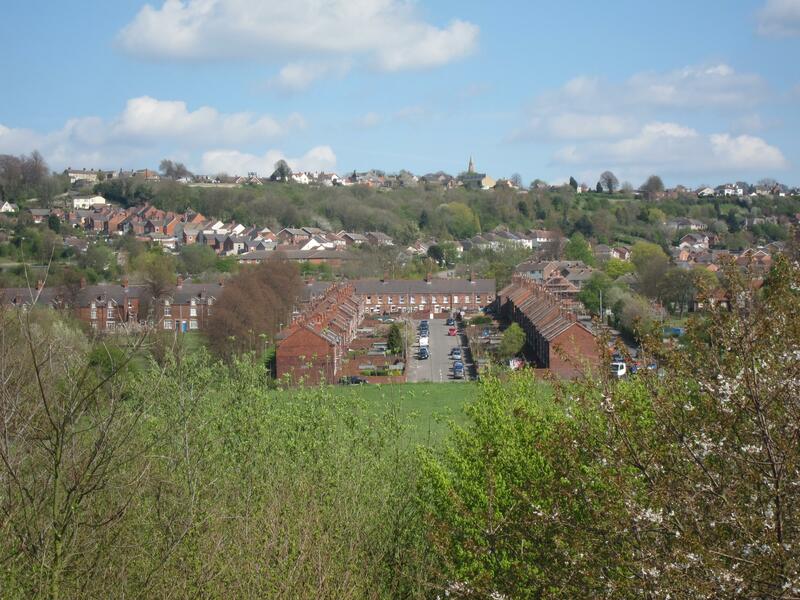 We’ve had a fabulous time working in Bolsover and been made very welcome, the first region of Past Lives Project tour, and we’re currently looking into local partnerships to allow us to stay working in Bolsover for longer. We’re working on recording the music score and creating a DVD of the Bolsover films if you would like to be contacted when the DVD’s are available please leave your details below. 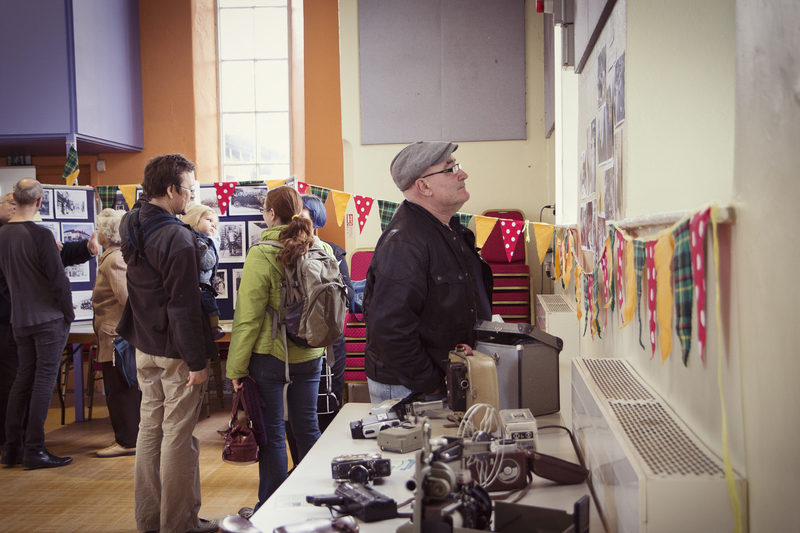 15th March we held an exhibition at Bolsover Assembly Rooms to share our findings and experiences from the project to date. 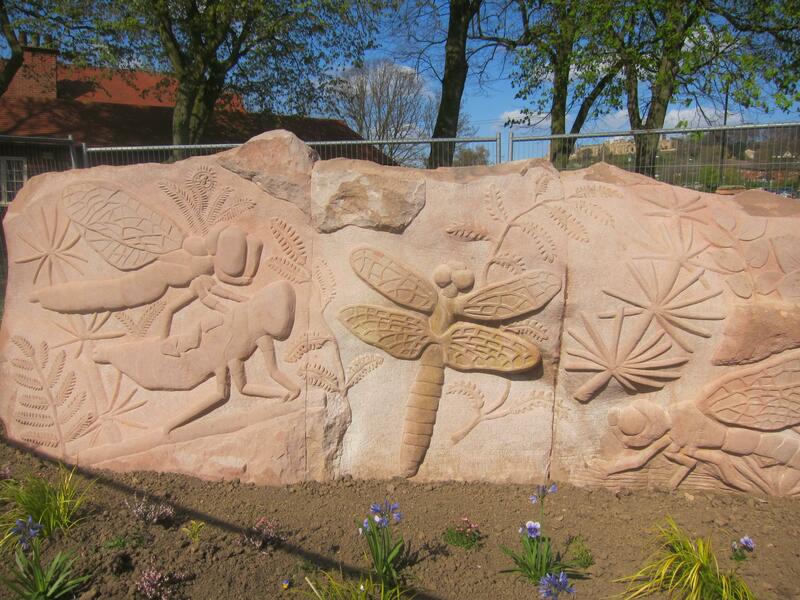 We’ve had a really great time working in Bolsover with lots of support from local public taking part in the project. 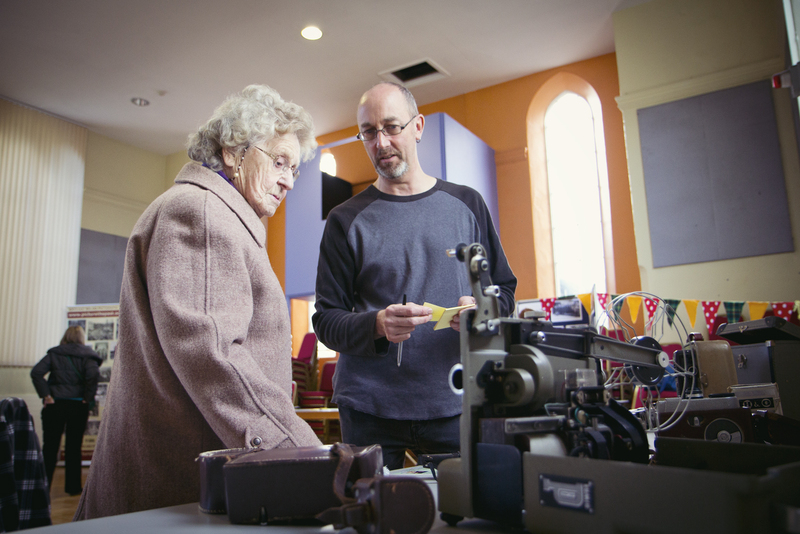 We shared photos from our scanning day, and hosted Reminiscence Vintage Cafe who helped keep everyone supplied in tea and cake. During the exhibition we asked visitors to write down any memories or knowledge they had of the photos and articles on show. 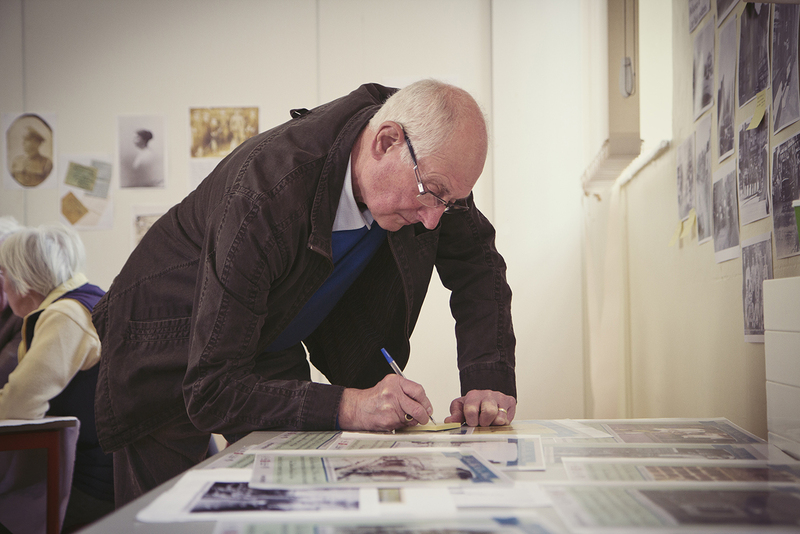 These notes will be added to Picture The Past photo archive to add history to the photos they already have of Bolsover, and to photos that have been added to the archive through the project. We had a 156 visitors to the exhibition throughout the day, and had many interesting conversations about Bolsover and great feedback about the project. Bolsover Past Lives Grand Finale! – Films you’ve donated, memories and music that Bolsover has shared has been transformed into a new original film with live soundtrack from international musicians and Bolsover school students. 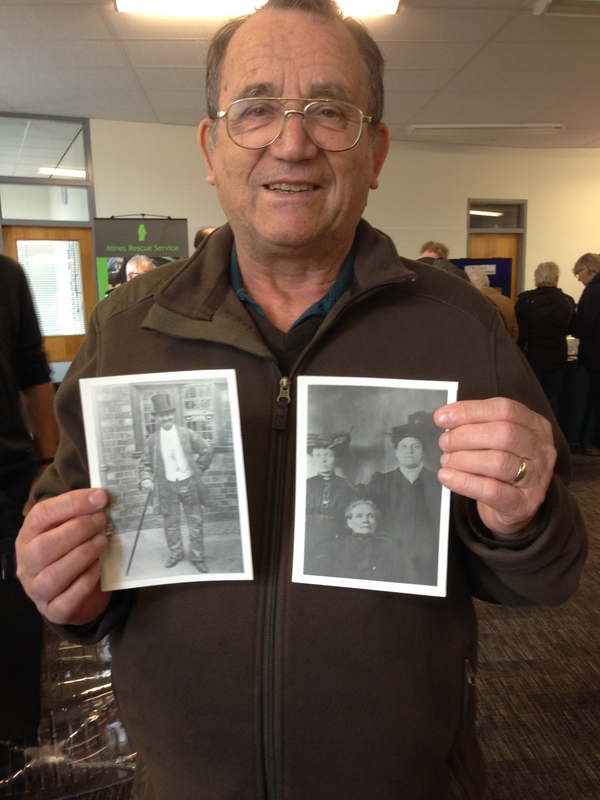 To help inspire Bolsover to get involved in their heritage, Debbie Cooper has worked with Picture the Past; photo archive for Derbyshire and Nottinghamshire to create a photo trail around the town from archive Bolsover and Carr Vale Photos. 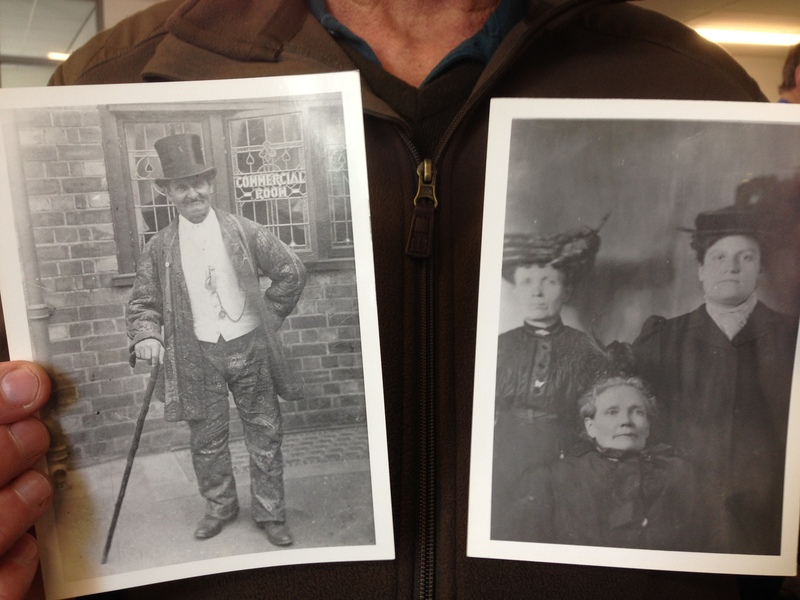 We have also include donated photos from Bolsover Civic Society and stills from cinefilm footage donated to the project. Here’s a few of the posters from the photo trail you can find the rest of the photos around Bolsover town over the next few weeks.